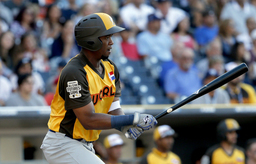 CHICAGO (AP) The Chicago White Sox are nearing a $43 million, six-year contract with highly regarded outfield prospect Eloy Jimenez, a person familiar with the negotiations told The Associated Press. The person spoke on the condition of anonymity Wednesday because the deal had not been agreed to. The contract would include team options for 2025 and 2026 that if exercised would make the agreement worth $77.5 million over eight years. Jimenez's deal would nearly double the previous high for a player with no major league service: Scott Kingery's $24 million, six-year contract with Philadelphia before 2018 season. Jimenez was optioned to Triple-A Charlotte on March 13. Ifthe 22-year-old is kept in the minor leagues for the first 20 days of the season, it would push back his free agent eligibility by one year until after the 2025 season.